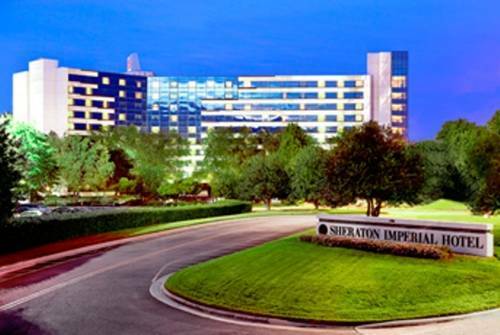 Indulge yourself with a lavish hotel stay offering a range of amenities at Sheraton Imperial Hotel Raleigh-Durham Airport at Research Triangle Park. Experience our outstanding location near the Raleigh-Durham Airport (RDU), UNC Chapel Hill and Duke University. Also offering close proximity to Perimeter Park and the Research Triangle Park, perfect for corporate outing, groups and conferences. After a busy day in the area, enjoy lounging in your spacious room with LCD TVs or stay productive with ergonomic workstations. Satisfy your appetite with a visit to Seasons Restaurant offering organic, local cuisine or take advantage of 24-hour room service or grab-and-go foods at The Cafe & Market. When it is time to retire, relax in luxurious hotel accommodations with plush, Sheraton Signature Beds, down comforters and modern bathrooms. If planning a business or social event, take advantage of our stylish venues with 34,000 square feet of sophisticated, flexible space, ready for your next event or conference. Seasons Restaurant: Savor delectable cuisine at Seasons Restaurant, located in Research Triangle Park near the RDU airport. Discover seasonal dishes and biweekly menus featuring organic and locally-sourced ingredients from local farms, mountain lakes and coastal waters. The Caf & Market: Begin your morning in Research Triangle Park with a Starbucks coffee or specialty drink at The Caf & Market. Our delightful little shop offers grab-and-go snacks, light bites and various refreshments for those on-the-go or traveling to RDU Airport.